Monday we went to do some afternoon biking in Pescadero County Park but missed our turn-off and next thing you know we're out of the mountains and on the coast. 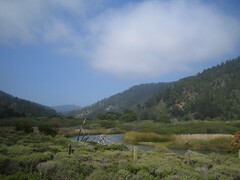 So instead we went south along the coast until we got to Big Basin and did part of the skyline to the sea trail. I took a GPS track but we didn't go all the way and I would like to take the complete track. So we'll be back. Five miles of it are opened to bikes, we did just over three before turning back and driving down to Santa Cruz. It ended up being a wonderful day for a scenic drive.